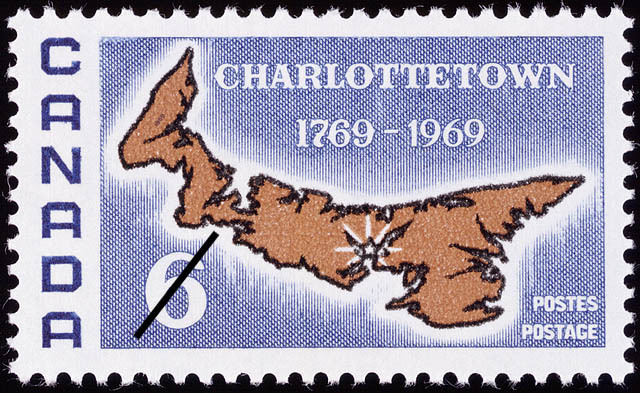 The value of a Charlottetown, 1769-1969 - 6 cents 1969 stamp depends on several factors such as quality and wear, supply and demand, rarity, finish and more. Values in the section are based on the market, trends, auctions and recognized books, publications and catalogs. This section also includes information on errors and varieties and characteristics. Micmac Indians, probably the first inhabitants of Canada's smallest province, knew their 2,184 square mile island home as Abegwelt, the English meaning of which is "Cradledon the Wave"; the island was later to become Ile St. Jean and eventually Prince Edward Island in Honour of Edward, Duke of Kent, father of Queen Victoria. Although attempts have been made to establish earlier discovery of Prince Edward Island by explorers such as John Cabot, Verazanno and Stephen Gomez, it is usually accepted that Jacques Cartier in the 1530's was the first visitor from the Old World. Charlottetown, once Port de la Joie, became Capital of an Island newly separated from Nova Scotia when on August 4, 1769 instructions from the Court of St. James were issued to Walter Patterson, the son of an Irishman from County Donegal, constituting him as Captain-General and Governor-in-Chief over the Island of St. John and instructing him to: -fit yourself with all convenient speed, and to repair to our said island of St. John, and being arrived at Charlottetown within our said island, which we do hereby appoint to be the capital of our said Government, and the chief place of your residence-. Governor Patterson's arrival on the Island was not until August 1770 at which time there was an estimated population of some 150 families.